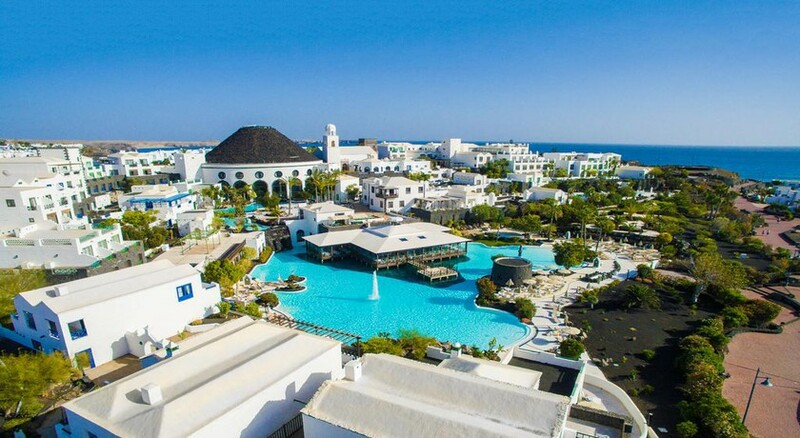 Located on the seafront facing the yachting port of Marina Rubicón in the south of Lanzarote, Hotel Volcán Lanzarote is a luxurious 5-star property offering perfect holiday experiences to travellers from across the globe. The hotel’s design, inspired by the island’s distinct architecture, reminds of a typical Lanzarote village where you can find traditional spots, backyards and squares, all of which make your stay more memorable. With 251 rooms to cater to the different needs of guests, the hotel also features five pools, four restaurants, three bars, conference rooms, spa centre, Jacuzzi, gym, sports facilities and entertainment shows. 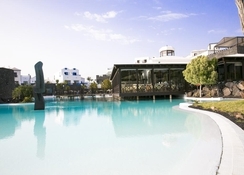 Hotel The Volcan Lanzarote also provides for a diverse range of entertainment options along with sports and leisure activities. Its adult-only Club Volcán offers 48 rooms that come with special services such as private breakfast (buffet)/breakfast in bed, discount on massages and treatments, heated private pool with waiter service, whirlpool bath on terrace, early check-in/late check-out and private parking with direct access. At a walking distance of eight minutes from the Playa Blanca beach, Hotel The Volcan Lanzarote is located next to Marina Rubicón. You also get to access the fishing village of Playa Blanca that offers a range of shops, bars and restaurants, as well as a seafront promenade. Timanfaya National Park is about 23km from the hotel. The hotel is around 30km from the Lanzarote Airport. 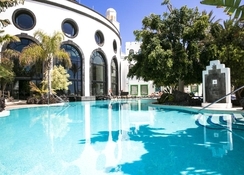 Hotel The Volcan Lanzarote accommodates its guests in 251 rooms featuring magnificent views of the Papagayo beaches, Playa Blanca village, the harbour, swimming pools and gardens from the balcony. Guests are welcomed into a living area with sofa, armchairs and tables, air conditioning, satellite television, minibar, direct telephone and a safe inside the room. The en-suite bathrooms feature mirror, hairdryer and other bath amenities. 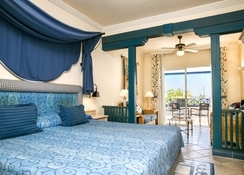 The suites have a separate bedroom and lounge, spacious terraces and a hydromassage bath. Club Volcán provides 48 adult-only rooms with private heated pool, Jacuzzi, solarium, Balinese beds and terraces with breath-taking views to Lobos Island and Fuerteventura. 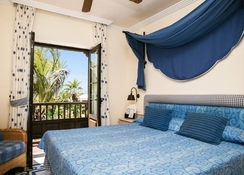 Hotel The Volcan Lanzarote serves delicious cuisines from Japanese to Italian at its onsite restaurants. There are two main buffet restaurants: Buffet La Florida and Buffet Club Volcán. You can enjoy drinks and beverages at Bar Las Coloradas, Bar Fun Pub or Lobby-Bar La Habana. 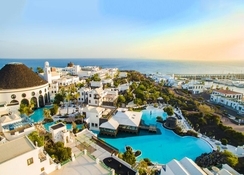 There are a range of sports and leisure amenities at the Hotel The Volcan Lanzarote, which includes a well-equipped gym, squash court, tennis court, billiards, multiple swimming pools, kids’ pool, mini disco, kids’ club and entertainment shows. The hotel also features a wellness centre offering spa, sauna, massage, Turkish bath, Jacuzzi and beauty treatments. Being close to the sea, one can easily walk down to the beach. We had the best time , beautiful spacious hotel , great location next to the marina with lots of bars and restaurants. Breakfast was delicious with so much choice , have been twice this year and can’t wait to go back! Absolutely stunning interior. First place my wife has said that she is happy to return to. Staff polite friendly and heloful. Breakfast was amazing for choices. Didnt eat any other meals but extremely happy. Biews from the bar upstairs were breathtaking. Spar fab too. Clean towels exchanged for the pool daily. I also give 5 stars on top of the 5 stars hospitality rating The Volcan Hotel already maintains . Fabulous hotel and an amazing holiday experience. Facilities are all excellent. Fantastic hotel,location over harbour loads of pools and the staff are brilliant. Five stars. Excellent hotel. Great value from teletext holidays. A real winner. The Public areas at the Vulcan Hotel are Amazing, our room was big,comfortable, stylish and cleaned everyday. Staff were always pleasant and helpful. We stayed at the Hotel Vulcan on a half board basis. Breakfast was Lovely, everything you could want and more. Dinner was okay but nothing special and as the hotel is on the Marina and right in the middle of all the restaurants ..... There is a gate by the pool that takes you straight into the heart of it, only bed and breakfast is necessary. Also the entertainment, when on, was only for an hour and didn't start until 10.pm so makes sense to go out and eat and catch up with the entertainment afterwards.The only reason I didn't give five stars was the pool area didn't seem to get cleaned regularly, looked grubby and this let the hotel down. We went as a couple and had a lovely time there and wouldn't hesitate to recommend it.